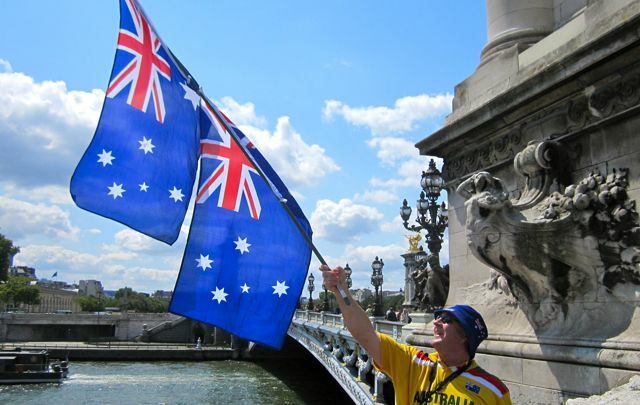 Tour de France 2013: A Sunny Aussie Sunday in Paris. A Sunny Aussie Sunday in Paris. Today we were all looking forward to the moment when Cadel and the BMC team led the race onto the finishing circuit in Paris and then to applaud his unbelievable effort to be the first Aussie to ride down the Champs Elysees in the Maillot Jaune and be crowned the winner of the world's greatest sporting event. It was also great to see the BMC team give their champion a great big group hug after the finish. It could be a great year to go down to Adelaide for the Tour Down Under next January. Big George is stumping up for another year and Cadel will be able to ride as an ex World Champ and the current TdF champion....how good is that for Ozzie cycling. To top it off today, it was a great moment to see the Goss/Renshaw lead out give Cavendish an armchair ride to the line. It was great to see Cav give them both a big hug of appreciation after the finish. 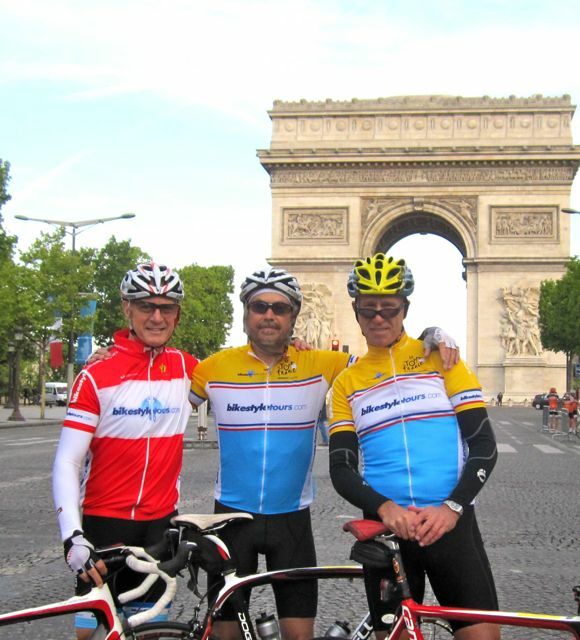 Out tour group was up early for a 6.30 am ride on the finishing circuit and to ride up the Champs Elysees for the photo opportunities. Today brings to a conclusion what has been a fantastic 3 weeks of cycling in France. 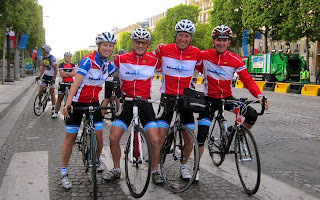 A big thank you to Bikestyle Tours for giving me the opportunity to ride with them as a guide and a great big thank you to all those I shared the road with during this great adventure. Our clients were a great bunch of people, from all walks of life and all with the same passion and interest in cycling and this great event in July. I was particularly blessed to work with a very professional and fun team of guides and support crew for this year's Tour and new friendships have been made that I hope will persist into the future. 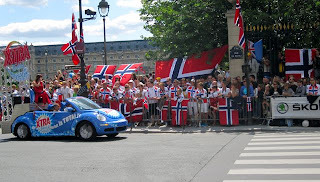 A few final photos of this final day of TdF 2011. 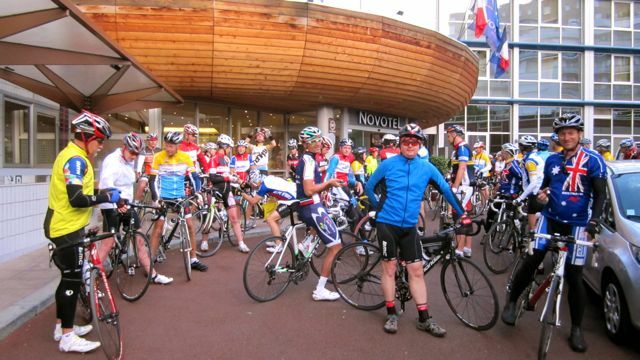 Bikestyle Tours assemble in front of our hotel this morning for our 6.30 roll around the finishing circuit. 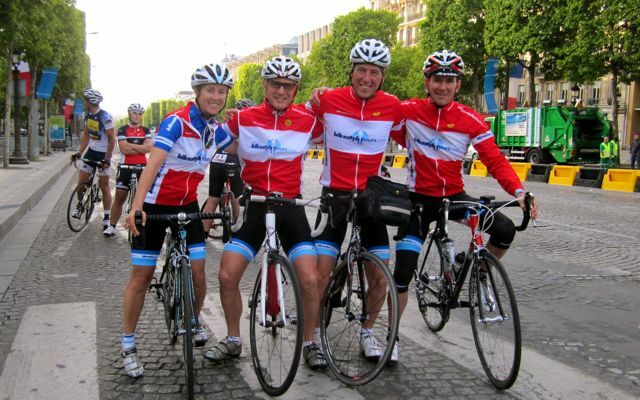 The guide team....Bec, Pete, Eric and Dave on the Champs Elysees. The Brisbane Boys....Pete, Bob & Pete. And by special request.....I kissed the cobbles to celebrate the moment. The Aussie flags were out in force today and many of our group had Australian regalia to celebrate our pride. Much to our delight, there were many calls of "Go Cadel" and "Aussie, Aussie, Aussie" as we rode around the circuit this morning. "Thor's Corner",.... the Norwegians had staked out the entry corner to Rue de Rivoli very early to display their pride in their "God of Thunder". What a great World Champion he's been this year. BMC leads the peloton onto the finishing circuit. Unfortunately, in my haste to get the shot I missed Cadel at the back of the group. You can just see him above the motorbike windscreen. 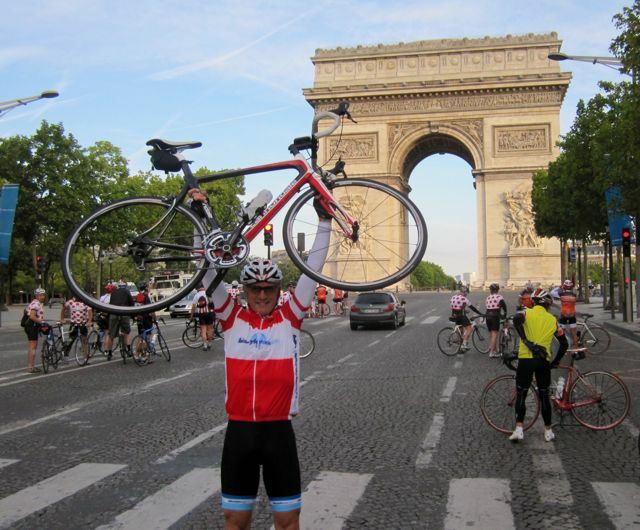 Peter, thanks for the opportunity to follow along with the Tour through your Blog. It was very enjoyable and I looked forward to your posts and to the additional travelogue information you provided. Best of all Cadel won and you were fortunate to be there to see it. Perhaps one day I might catch up with you at the Toombul track. Well what a time to tour the whole journey in 2011 - how blessed were you, and all of us in the tremendous achievement of Cadel - this marvellous Aussie, so humble and thankful and so well spoken in spite of all his emotion. Glad to see you kissed the cobbles for Pen, actually makes one see how bumpy they must be to ride on! Also you can see Cadel in yellow at the back of the BMC group...just! 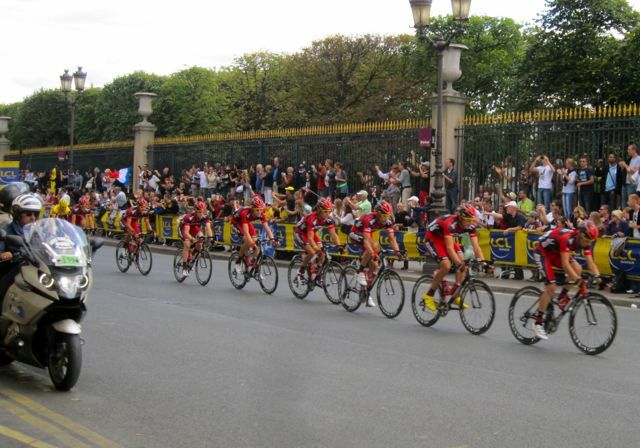 I loved how they did the decals on their BMC team cars in yellow plus all had yellow sunnies on the team. Race of Truth - Cadel can do it!! The Shack & Europecar crash our party! !